Q: You decided to pursue Integrative Medicine when you introduced acupuncture in the US during your stay.? I brought the needles to the US for personal use, and my friend wanted to give it a try. Words spread of the positive experience my friend had, and I was invited to give a lecture at MIT (Massachusetts Institute of Technology). At first, I refused the offers as I was not a practitioner, but eventually I studied English terminologies and decided to give the lecture. 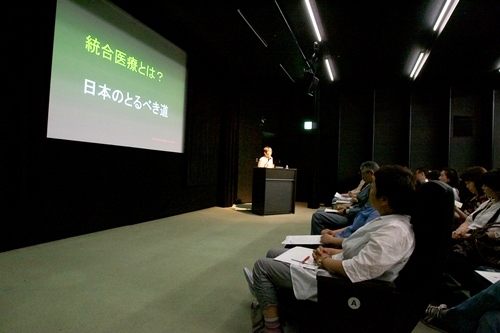 Audience included people with high honor such as a Nobel laureate, and I was surprised with their positive response. I was impressed by their flexible attitude to learn new things, but was overwhelmed with a sense of urgency to introduce Oriental Medicine, including acupuncture, in Japan before anyone else. For years, I studied and learned from specialists on homoeopathy, Chinese Medicine, Alternative Medicine and Qigong. We've gradually created the infrastructure of current Integrative Medicine in Japan. However, Western medicine still plays the central role in the current medical field in Japan, and there are less doctors like me. There is no one cause of disease, and therefore Western medicine cannot treat or cure all diseases. While Western Medicine has its good side, we need to understand that mental and physical health are inextricably linked. Oriental Medicine emphasizes the connection between the mind and body, and the study draws attention to medical practitioners from all over the world. Q: Do you think in an ideal world, doctors will be out of work? I always tell my patients that you know your body the most. I believe that as a doctor, it is our responsibility to help and support how to the patient manages their particular condition. The reality could not be any further from my belief. We still see the tendency where patients rely too much on going to a hospital to seek a doctor's guidance. Patients should be more responsible for their lives and be aware of their body condition, and make important choices. As I've stated in one of my books, people normally start seriously thinking about their own health when diagnosed with terminal cancer, but that's when it's too late. This is why I am advocating preventive healthcare, and encourage people to try to cure the condition before going to the hospital. In reality, patients too often casually drop by the doctor's office to seek advice or treatment, resulting in the doctor to have limited availability to spend time on individuals. I only see patients on appointments basis. This allows me to spend enough time to talk with them and offer customized advice that fits their individual health needs. Integrative Medicine is still new so we receive many visitors who seek treatment options beyond those that are typically offered in conventional medical care. Our mission is to educate patients and have them involved in every step of the decision making for their treatment. I believe both parties should be able to have an opinion in the decision making process by sharing information, taking steps to build a consensus about the preferred treatment, and ultimately reaching to an agreement on the treatment to implement. Q: Are you planning to provide training on Integrative Medicine for young medical practitioners who admire your belief and want to offer similar medical practice in the future? Doctors are generally too busy to think about such things. They tend to be conservative and do not jump into new ideas and thoughts. Even so, I see many people disagree with the current medical system and are seeking for the change. There are many publications discussing this issue. I continue to work at the university hospital because I want to establish a training program where we can teach philosophy of medicine. There are still many challenges but this can be achievable if I have colleagues who share the same goal. A monk once told me, "Doctors should be respectable and noble". Some individuals want to become a doctor because it is a high-paying and stable job, but I believe many young practitioners has the pure motivation to wanting to save people's lives. In order to encourage this thought, We need to shift the focus to preventing diseases and encouraging doctors to spend more time with patients, although this is still not realistic. For that reason, we need to fundamentally change the way we practice medicine. 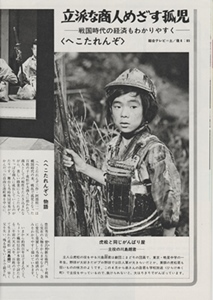 Dr. Kawashima played a protagonist in a NHK drama when he is a child. He had many offers from famous TV directors to continue his acting career, however, he quit and decided to pursue his passion in medicine. 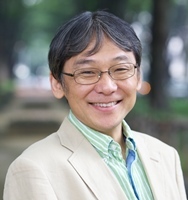 Kawashima believes medical practice is rather sacred, like a religion. Focusing on ethics and philosophy of Medicine is necessary and doctors should not be tempted to pursue their own interest. I hope Dr. Kawashima's idea inspires young medical practitioners. As a patient, we should take ownership of our own health as we should know our body the most. Doctors are there to provide guidance, but they are not Gods. The "I will protect my own body with my knowledge" mentality and awareness will ultimately resolve medical issues.